Our club works hard every year to host fundraisers in our community to raise money to benefit numerous community needs and organizations that align with Rotary's areas of focus (https://www.rotary.org/en/our-causes). 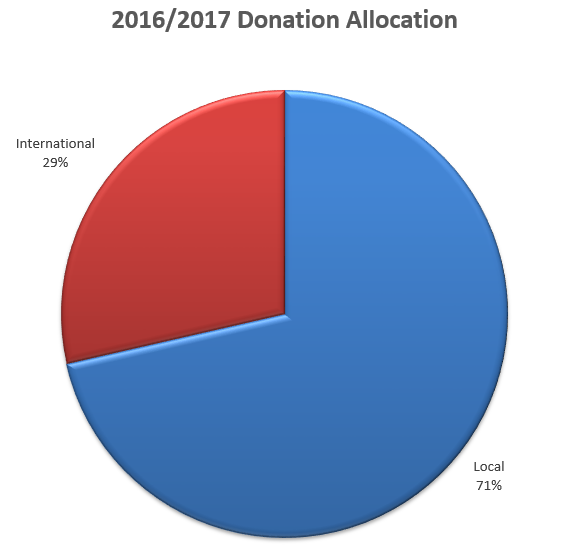 Below is a chart that shows the percentage breakdown of the funds Alton Centennial Rotary Club raised through club dues and with the community support of our events from July 2016 through June 2017. Alton Community Services, Barnstead Food Pantry, The Belknap House, End 68 Hours of Hunger, Meals on Wheels, New Durham Elementary, New Durham Food Pantry, Pearson Road Community Center, PMHS Robotics Team 319 BOB, PMHS Future Business Leader of America, College Scholarships (1 each for Alton, Barnstead, New Durham), Pure Water for the World, and more!